Aluminum Signs of all types - Custom Silk Screen printed with any image. ORDERS OF LESS THAN 12 SIGNS WILL BE MADE WITH 3M 2MIL VINYL GRAPHICS. Our aluminum screen printed signs are printed using a solvent based ink that is cured at 400 degrees. The black ink can last over 25 years outdoors. The ink is scratch and solvent resistant. It will not chalk or fade. We can print aluminum signs with any wording, including pictograms and logos. We can put your company name and telephone number on the sign for no extra charge. Please contact us if you want custom information on your signs. 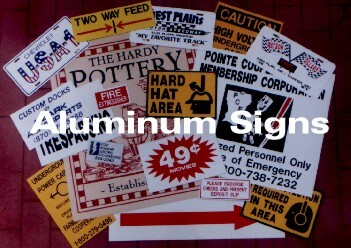 Aluminum signs can be made in hundreds of sign styles with an endless variety of symbols, colors and sizes. All we need is a fax showing what you want, and we'll make a scale drawing and fax it back to you usually within 4 hours. And your Company Name, Logo and Phone Number can be included. Then, once we have made a particular product for you, we'll keep the image in our computer for future orders.